Roberto Clemente: What Would Have Happened 50 Years Later? Fifty years ago the Pittsburgh Pirates won one of the most sensational World Series in major league baseball history. Last month in October, some of the living former Pirates teammates from that magical 1960 squad met to live once again the vivid memories of the day that stands above all others in Buccos history. Yes, better than the world championships of 1971 and 1979, both times against the Baltimore Orioles. They came together last November 13 for a theater showing in Pittsburgh of a discovered film of NBC’s Game 7 telecast against the New York Yankees. A copy of which no one knew existed. The film was made at the time for the late Bing Crosby, the famed entertainer who long owned a small share of the Pirates. The main highlight was once again to enjoy Bill Mazeroski’s historic homer in the ninth inning that gave the underdog Pirates a 10-9 victory over the New York Yankees in Game 7 of the World Series. A player that probably would have to come to terms with history that evening was Roberto Clemente. In 1960 the “Cometa de Carolina” from Puerto Rico had a magnificent season hitting .314, fourth in the National League and leading his Pirates with 94 RBI. Later, in the postseason, he continued his torrid batting, hitting safely in every game of the World Series against the Bronx Bombers, hitting .310 with three RBI. However, history tells that Clemente after the World Series was infuriated and enraged because he felt snubbed by all the media. Weeks later he was maddened even more when it was announced that he finished eighth in the National League Most Valuable Player voting. He really thought he was underappreciated after a season he was a two-time All-Star and one of its main offensive lumbers. For that Clemente never wore his 1960 championship ring. In spite of his feeling that he was given a cold shoulder, possibly it gave him, in the long run, the spark to one of the best careers of any player in history and a path to the Hall of Fame. Clemente, after that 1960 season, began a streak of eight consecutive seasons in which he batted no less than .312. He won 12 consecutive Gold Gloves, went to nine consecutive Midsummer classics out of his 14 All-Star appearances and won the 1966 National League MVP accolade. Later in 1971 the Bucs went to the World Series and Clemente hit safely once again in every game. This time he was honored with the World Series MVP trophy. Clemente was one of the most outspoken players in baseball and first among Latinos in Major League Baseball. If he would have been alive it would have been very interesting to listen if he would have forgiven what happened back in 1960. Also, if he would have met new Manager Clint Hurdle, what advice would he have given to him? What would have been Clemente’s words to the new skipper of a Pirate team that lost 105 games and has averaged 97 losses the last six seasons? Furthermore, last season the team was next-to-last in the majors in offense and last in pitching ERA and defense fielding percentage. The Pirates, not since 1992, have finished a season above the .500 mark. Simply, the longest streak of losing seasons in major league history. By the way, Clemente knows about futility. Before his magnificent 1960 season he played for a Pirate club that had suffered through three straight 100-loss seasons and was the laughingstock of the sport. What Clemente would have said: Godspeed. Roberto Alomar and Edgar Martinez: First Ballot Hall of Famers ? Once upon a time Puerto Ricans used to chat about just two boricuas Roberto Clemente and Orlando Cepeda being in baseball Hall of Fame. If dream comes true like a fairy tale story this same time around next year we can be praising two more. That fantasy could be reality next December when members of the Baseball Writers Association of America will receive ballots that list candidates eligible for induction into the Hall of Fame in 2010. 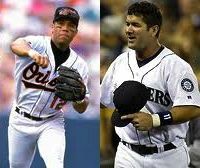 With historical and stats records furnished to them and with their own perception of greatness to back up their judgement, there should be great hope in Puerto Rico the writers wii consider our own Roberto Alomar and Edgar Martinez. In my opinion, their career records should assure them of gaining acceptance and earning plaques in Cooperstown and why not in their first year of eligibility. Roberto Alomar was one of the biggest stars and arguably the best second baseman in the history of the game. He was a 12-time All-Star, 11 consecutive seasons from 1991-2001, in 17 major league seasons. In the same career time he won 10 Gold Gloves, the most by a second baseman ever. In his prime he was doing everything right at second base a la Ozzie Smith did at shortstop or Brooks Robinson at third base. Going strictly by his offense, his numbers are hall of fame too. He finished his career with a .300 batting average and among hall-of-fame comparisons he had more career hits and RBI than two other Hall-of-Fame second basemen Joe Morgan and Ryne Sandberg. Not enough ? In Alomar’s case, the most basic statistics should serve. Among all second basemen, Alomar ranks sixth in hits, seventh in runs scored, 10th in RBIs and fourth in steals. When he called it quits he was just 276 hits shy of 3,000 hits. Among his hardware let’s not forget he was an American League Championship Series MVP (1992); All Star Game MVP (1998), two-time World Series member (1992,1993) and a four-time Silver Slugger Award. A three-time Toronto’ Player of the Year, franchise that inducted him into their Blue Jays Level of Excellence group last year and a two-time Cleveland Indians’ Player of the Year. On the other hand, Edgar Martinez accolades are very,very long. To start, when as soon Martinez retired Major League Baseball recognized him as the greatest designated hitter of all time and renamed its yearly Designated Hitter Award as the Edgar Martinez Award. And its qualifications are his own numbers. The 18-season veteran is only one of six in all history to have finished its career to have a batting average of .300 or more, on-base percentage of .400 or more, a slugging percentage of .500 or more, 2000 hits, 300 home runs, 500 doubles, and 1000 walks. He is the Mariners’ all-time leader in hits (2,247), doubles (514), walks (1,283), and games played (2,055). He is also among the top 10 in other categories including at-bats (7,213), runs (1,219), home runs (309), RBI (1,261), total bases (3,718) and extra base hits (838). He was among many recognitions a 7-time All Star, 5-time Silver Slugger, 2-time American League batting champion (1992, 1995) and won the Roberto Clemente Award (2004). He was also a two-time Mariners Player of the Year. By the way, let’s not forget Edgar is “Señor Mariner”” not only in Seattle but in the whole Pacific Northwest. He was so cherished the Mariners waived the waiting period so they could induct him into the team hall of fame after his 2004 retirement and on the south side of Safeco Field named a street after him. Moreover, the Mariners have not issued Martínez’ #11 jersey since he retired. Last March during the second round of the World Baseball Classic in Miami we were fill the blank with the proper adjective to have the lead for The Puerto Rico Daily Sun that Iván Rodríguez was going to be playing his 19th season in the Majors with the Houston Astros. Four months in the calendar have gone by and ‘Pudge’ is in the news again. The Vega Baja native is set for history again. He will become the all-time major league leader in games caught passing Carlton Fisk 2,226 behind the plate. Coincidentally, Fisk was the opposing catcher when Rodriguez made his debut on June 20, 1991. Moreover, in interleague play he is in line to break the record against his original team, the Texas Rangers, June 16-18. 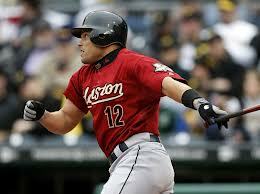 If any one have forgotten, Rodriguez, 37, played 12 seasons with the Rangers. It was in Arlington were he established his actual credentials. In Texas he was a 10-time All Star; won 10 out of his 13 Gold Gloves; 6 of 7 Silver Slugger awards; the 1999 American League MVP and many, many other honors and recognitions. In 2003 he added to his resume something that he could not enjoy as a Ranger. As a Florida Marlins he have a dream season (.297, 16 HR , 85 RBI) and led his young club to the World Series. He was the 2003 National League Championship Series MVP against the Cubs and one of the leaders in the win against the Yankees. “I still can play this game on an every day basis,” Rodriguez said. “I just look forward to have a great year and make this ballclub (Astros) in the playoffs. That’s going to be my goal”. At this moment the Astros are off in the race in their Central Division but in the other hand Rodriguez (.259, 5HR, 24 RBI) is showing good shape to keep playing in the Majors. No matter he have surpassed Fisk and Johnny Bench in numbers and recognition, ‘Pudge’ have been clear that with his discipline, hard and strong ethic work if he can go on he will. And is no secret he’s next goal is try to reach the 3,000-hit plateau. Time will tell if he will achieve it or not. However, no matter what, Rodriguez at this moment is enjoying the big moment and no doubt once he retires he will be bound to Cooperstown. Carlos Delgado: Hall of Fame Bound ? Next month the Hall of Fame will dedicate !Viva Baseball! an exhibit celebrating baseball in the Caribbean Basin countries. Latino Hall of Famers like Roberto Clemente, Orlando Cepeda and Tany Perez will be featured in the exhibit. Same as a series of present day stars. Of such today’s luminaries one of them is Aguadilla’s favorite son Carlos Delgado. Does this will be his first staple in Cooperstown and turn to be a permanent one. There is no doubt Roberto Alomar will be the next boricua in the pavilion. No matter how much discussion there have been after 35 years of the role of the designated hitter Edgar Martinez should be the first honored. Ivan Rodriguez is enjoying another summer in the diamond but no discussion there should be when he finally decides to hang his shin guards and mask that he will be a first ballot shoo-in. The present New York Met in 17 seasons, year after year, has proven all baseball people his star status. No matter originally a catcher, he was switched to first base. His bat has done all the talking. 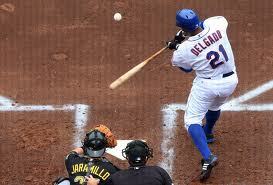 Delgado, 36, holds the all-time home run and RBI record among Puerto Rican players. If healthy, this season he could be the fifth Latino to join the home run 500-Club. Already he is among only six Latinos with over 1,500 RBI’s in a career. Delgado is the fourth player in the majors history to hit at least 30 homers in 10 consecutive seasons, and he amassed 100 RBI or more in seven of his ten full seasons. In the days as a Blue Jay, those numbers were fueled with 6 consecutive seasons with over 30 homers and 100 RBI’s. Those amazing numbers and many others still hold several Toronto’s single-season and career records. Moreover, it was in Canada he won the 2000 Hank Aaron award and 3 Silver Slugger honors. He added to his hardware, the 2006 Roberto Clemente Award due to his great charity work outside the baseball fields. And this is just a summary. His actual resume very well compares with the career of such greats first baseman as Willie McCovey and Willie Stargell. Delgado says he does not have control of how writers look to him at present and how he will be foreseen in the future. Probably is true but if healthy Delgado continues racking numbers the votes for Cooperstown will be by them. Probably we will know his induction by 2020.